Annually Testing your Soft-Coated Wheaten Terrier is very important, as it not only gives you a ‘snap shot’ on general health but also it can pick up early stages of the hereditary diseases, this is very important! Yearly monitoring and keeping records of health tests undertaken at your vet will help you and your vet see any subtle changes from year to year. Tests required prior to breeding are also important for the sire and dam. Annual blood and urinalysis monitoring; Eyes and Hips and Genetic tests should be undertaken to ensure the adult breeding dogs are fit and healthy at the time of mating. 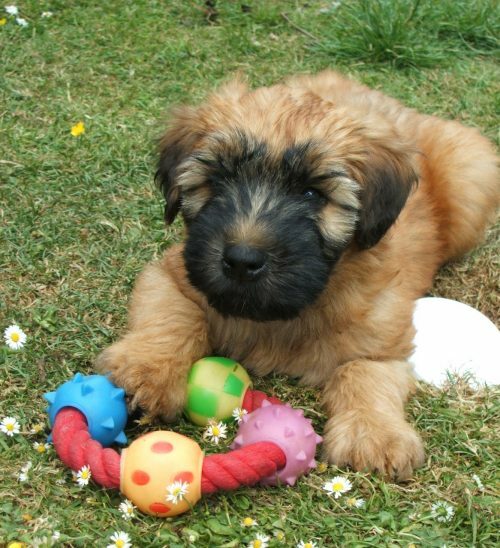 It is advised Breeder’s educate themselves on the diseases that can affect the Wheaten Terrier. Post Mortem (PM) – the PM section has information on what is required should your dog sadly die of a known or possibly suspected hereditary disease as proper diagnosis is very important. The Club can also help Members with costs. The following tests are recommended for adult dogs (after 15-18 months of age) and should be undertaken annually, as well as prior to any mating. Blood and urine tests cannot predict whether a dog will develop these diseases, but they can determine whether or not a dog is clear of signs of disease, and establish baseline values for future comparison. Early detection can offer more choices for treatment and can often provide longer and better quality of life. Your Vet can check for signs of diseases and can undertake blood and urine tests ‘in-house’, or they may use an external laboratory service. Your Soft-Coated Wheaten Terrier should be ‘fasted’ (i.e. should not eat eight hours before the blood test), otherwise spurious results may occur. Important – drinking water should be available at all times. * Final confirmation of RD, kidney biopsy (wedge, not Tru-cut). 1. A sample first thing in the morning for 3 consecutive days. If first thing in the morning is not possible, then it should be about the same time each day for the three days. 2. The samples should be saved separately in the refrigerator. Note: the owner should NOT pool them in one jar. Vet: Take 1ml from each sample, mix the 3ml together gently, and send off the 3 ml mixture for one UPC determination which will be an average result of those 3 days. UPC on urine samples collected at the clinic are often higher than those collected at home, probably because of anxiety/stress and increased blood pressure at the clinic. Should you choose to breed your Soft-Coated Wheaten Terrier, it is recommended that both the sire and dam have the following tests carried out prior to mating (i.e. within the previous 12 month). * Blood and urinalysis. The Club requires that as a minimum, the blood test should include Creatinine, Urea, Albumin and Total Protein. If there are any signs of protein in the urine dipstick test, a follow up test should be carried out a week or two later. Should a second test still show signs of protein, then a urine protein/creatinine ration test is required. * Eye testing (eye test certificate carried out annually). These tests are part of the British Veterinary Association (BVA) Health Schemes. More information about the eye scheme itself can be found at the following link – BVA Eye Scheme. You will also find a list of up and coming eye testing sessions on the BVA Eye Scheme link. This will help you find a location holding a session near to you. The BVA update this list every couple of months. * Hip Score (this only need be undertaken once in a dog’s lifetime). Most Vet practices undertake hip scoring and you will need to discuss with your vet about this. There is also more information on the BVA website. * Genetic PLN-Associated Variant Gene Test (PLN) (this only need to be done once in a dog’s lifetime). These can be undertaken for either an individual dog or a litter. The PLN -Associated Variant Gene Test can be carried out at either Penn Gen in the USA, or through Laboklin Laboratories in the UK. Please refer to the “DNA – Storage and Testing” section under HEALTH for more information on how this test can be carried out. PLEASE NOTE: Laboklin Laboratories & The Soft-Coated Wheaten Terrier Club of GB have negotiated a reduced rate with Laboklin if both the PLN and DM tests are taken at the same time. Please contact the Health Team here for information and forms specifically for this purpose. Please note: Further information on Eyes and Hips are available under the HEALTH section of this website – go to the sub section called Conditions Affecting the Breed. Puppies’ body systems are immature and to undertake a complete blood and urinalysis before the age of 15 to 18 months could possibly produce spurious results. Therefore, unless a Vet specifically advises that a full blood and urinalysis is necessary, it is not required for such a young puppy. Responsible breeders, prior to homing their puppies, undertake tests on their litters. DNA storage – At the same time as the basic kidney function test an additional amount of blood can be taken and sent to the Animal Health Trust (AHT) for DNA storage. Cheek Swabs are also available to undertake DNA Storage. Please see the section on “DNA – Storage and Testing” under HEALTH, for more details. Eye test – At approximately 6-8 weeks of age a BVA approved Ophthalmic Vet, can check for retinal folds and other eye diseases. If you would like to know more about the eye tests themselves information can be found on the BVA website using the following link – BVA Eye Scheme . You will also find a list of up and coming eye testing sessions on this link. The BVA update this list every couple of months. Every Soft-Coated Wheaten Terrier is an important link for the entire breed. Their legacy may be able to help others that come after them. If your dog is so ill that euthanasia seems likely and you are willing to have a post mortem, it is strongly advised that you provide your vet with this information in advance. The kidneys of any Wheaten Terriers dying of kidney failure or anaemia should be sent to the Animal Health Trust (AHT), as this is the only way of confirming RD. This should be done for any dog up to the age of 8 or so for RD. It does not mean a full post mortem is required for the dog. Two kidneys, cut in half, and preserved in 10x volume of 10% buffered formalin. Blood: 5ml serum AND a maximum of 5ml in EDTA (anticoagulant). Urine: A sample of at least 5ml. Please note: If there has been a presence of GI disease previous to clinically evident PLN, this could be a sign of both conditions (PLE and PLN). In this case intestinal samples should be included below. Half-inch long sections of the duodenum, jejunum and ileum preserved in neutral buffered formalin solution. Please Note: these samples should be taken within an hour or two after death due to rapid deterioration of the gut. With your permission, part of the blood sample can be used for DNA storage at the AHT where our Club is building a bank of Wheaten Terrier samples for any research into health problems now or in the future. There is no charge for this storage, but a 5-generation pedigree is required. The Club can provide this for you – please contact the Health Team through this link – Health Team. It is advisable that your veterinarian notifies the AHT that a sample is being sent for post mortem. The Soft-Coated Wheaten Terrier Club Health fund is available to help with post mortem costs in cases where inheritable disease may be present. The Club in return requires a copy of the post mortem report. The post mortem report will be sent to the referring veterinary practice by the AHT who will then relay the results to the owner of the dog. Owners are encouraged to tell their breeder of the results and to send a copy of the report to the Soft-Coated Wheaten Terrier Club of GB for the Health files.